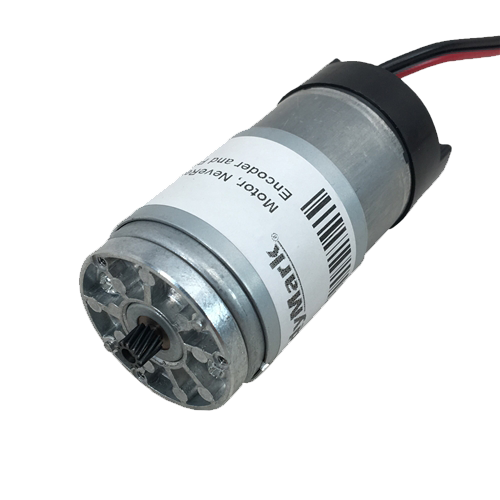 DC motors are an integral part of hobbyist and competition robotics, and proper motor selection is essential to successful robot design. To help understand this key relationship, VEX has developed an educational guide that explains the four key characteristics of DC motors and how they can be used to select the ideal motor for your application. Furthermore, to ensure that users have the data needed to make such a selection, VEX will also be testing popular motors using industry-standard methods and publishing the results. Click on any of the motors below to view more details, including a complete motor curve. If you have any questions, feel free to contact prosupport@vex.com. VEX Robotics motor curves were developed experimentally using a “down-up” dyno test. A variety of data, such as output speed, output torque, current draw, and power input/output, is taken throughout this test. The “down” (brake applied) side is then averaged with the “up” (brake released) side. The mechanics of a dyno test are crucial to developing and publishing accurate motor specifications. When a motor is spinning at free speed while attached to a dyno drum, the system contains a high amount of rotational inertia. This inertia complements the motor’s own output, creating a false reading for peak output power that can be higher than the motor’s actual performance. However, manufacturers do not always adjust for inertia cancellation when measuring their motor’s performance, and spec sheets rarely detail the circumstances under which their information was derived. By testing and averaging both the “down” (inertia helping the motor) and “up” (inertia resisting the motor) sides, this method is the best way to represent a motor’s true capacity. Note: If you know the efficiency of the motor, you can also determine how much heat is being absorbed by the motor during this test. This is also useful for learning how fast a motor conducts heat to the exterior. This test helps to gauge the "durability" of the motor, experimentally determine stall torque, and observe how it handles rapid heat buildup.